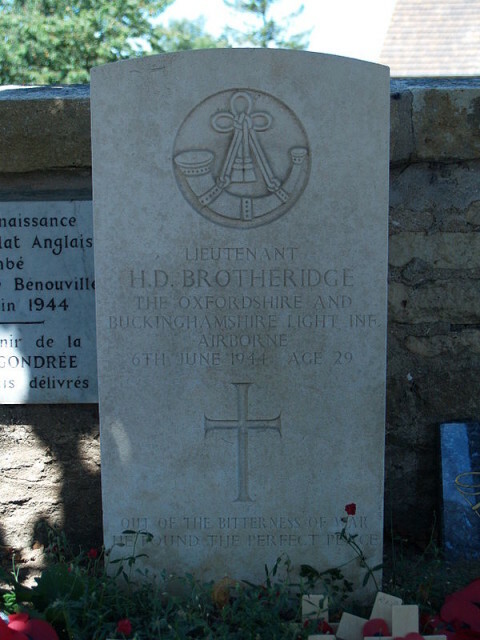 During World War II, Lieutenant Herbert Denham “Den” Brotheridge was a platoon commander of 25 Platoon, D Company, 2nd Battalion of the Oxfordshire and Buckinghamshire Light Infantry, often called the 2nd Ox and Bucks. His place in history is marked by the significance of his death almost 20 minutes after midnight on June 6, 1944. Brotheridge was shot by a German machine gunner while leading the charge of D Company during a mission vital to the D-Day landings in Normandy. He thus became the first Allied soldier, and British officer, killed in action by enemy fire on D-Day. Though marked by his death, the story of the mission that took Brotheridge and his comrades into German-occupied France on that monumental day was one of clever tactics and swift, courageous action. 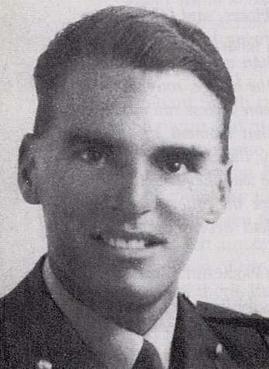 Lieutenant Herbert Denham “Den” Brotheridge. Fair use. Brotheridge was born in Smethwick, Staffordshire in 1915 and commissioned into the 2nd Battalion Ox and Bucks in 1942 under the command of Major John Howard. The Battalion was airborne light infantry—more specifically, glider troops. These men were trained to drop undetected into enemy territory in Airspeed Horsa gliders. 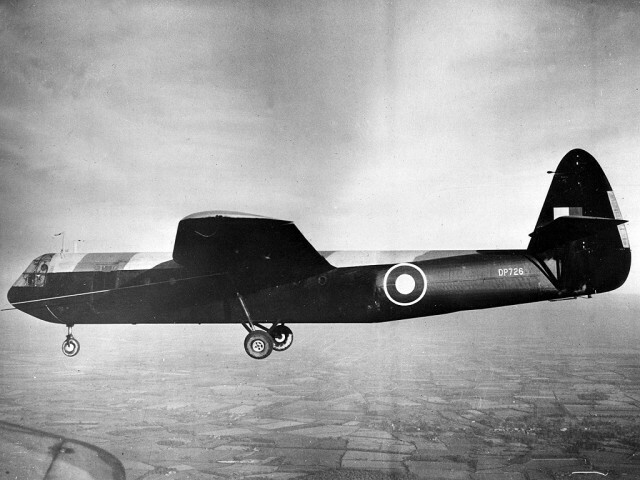 The gliders resembled transport planes of the time, but were made mostly of wood and had no engine. They could carry around 25 soldiers and their equipment, or even jeeps or a light tank. 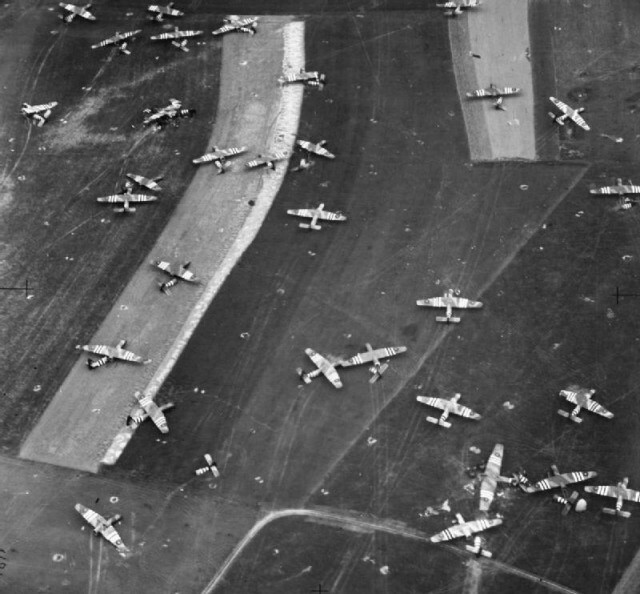 Airspeed Horsa gliders on Landing Zone ‘N’, June 7, 1944. To achieve flight, a Horsa would be attached to a tow cable, towed into the air by a bomber, and then released to glide silently towards its target. The pilot would locate a clear landing space and touch the glider down, hopefully without obliterating the plane. This method of airdropping infantry into the battlefield had its pros and cons in comparison to paratroopers, but using gliders prior to the amphibious invasion of Normandy proved to be a major success. Silent in the dark of night, the British Horsas remained undetected before they landed. As a result, the men didn’t experience the terribly high number of casualties that paratroopers later did when lit up by searchlights in the early morning of D-Day. Major Howard and his men were chosen for Operation Deadstick. The mission objective: capture and secure two bridges over the Caen Canal and River Orne a few miles northeast of Caen. If they failed, British forces landing on Sword Beach later that day would have no exit to the east. Worse, the landing forces might have to deal with even more German troops and tanks crossing the bridges en masse. Knowing the Germans were prepared to blow up the bridges rather than lose them to the enemy, a swift surprise attack was necessary for the Allies to secure the bridges intact. The Horsas made such a mission possible. 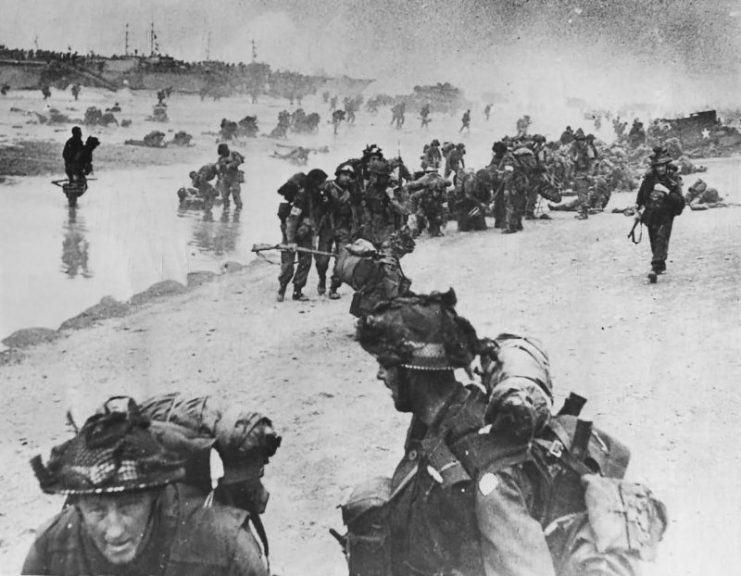 British troops on Sword Beach, 2 Battalion, Middlesex Regiment of 3 British Division, D-Day, 1944. Howard rode in the first of six Horsas, which also contained his good friend Lt. Brotheridge and his platoon. A total of 180 men embarked on the mission: the 2nd Ox and Bucks’ D Company, a platoon of Royal Engineers, and the glider pilots. They were all pulled into the air at 20 minutes before midnight on June 5, 1944. 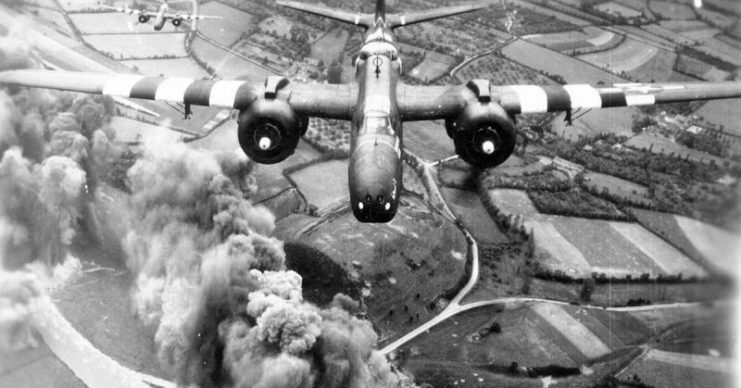 Once over the English Channel, the bombers towing them released their cables and sent them soaring through the night towards Normandy. The glider troops first touched down 16 minutes after midnight on June 6, right outside their target. Three Horsas, one containing Brotheridge’s platoon, came down hard west of the Bénouville Bridge over the Caen Canal. 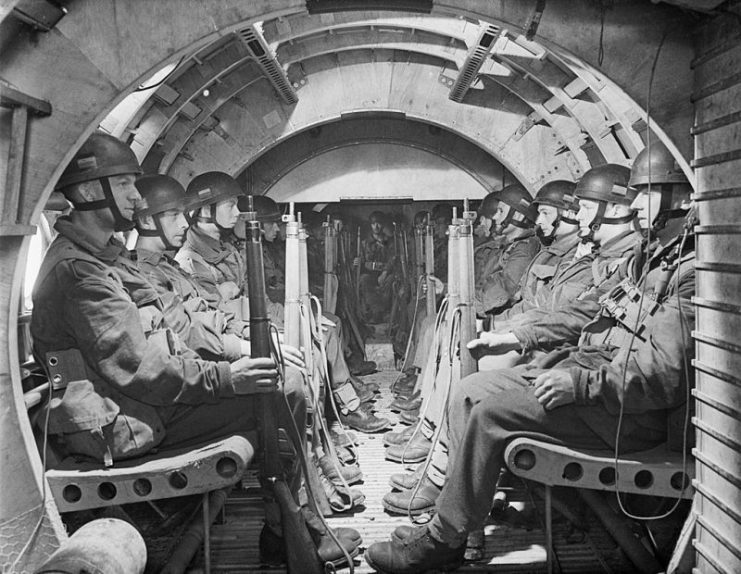 Troops seated in a Horsa, prior to take-off. As the gliders crash-landed, many men were knocked unconscious or otherwise injured. One Horsa snapped in half, throwing an unconscious Lance Corporal named Fred Greenhalgh into a pond where he drowned. He is perhaps technically the first lost hero of D-Day but wasn’t killed by enemy fire. The surviving men quickly and quietly gathered together. To the hushed call of Brotheridge, “come on lads,” his platoon rallied and they hurried towards the bridge and battle. Though the Germans knew these back-to-back water crossings were one of the most strategically vital points in all of occupied France, they were caught off-guard. Only two sentries stood watch. 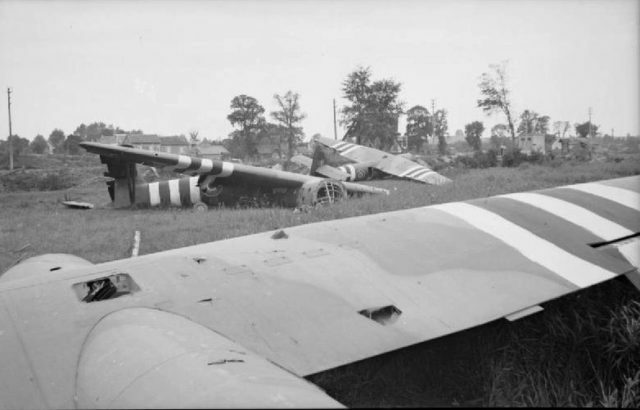 The three Caen Canal gliders; the bridge is hidden by the trees in the distance. The two German soldiers jumped into action as they spotted the onrush of British soldiers emerging from the darkness. “Fallschirmjäger! Fallschirmjäger!” (“Paratrooper!”) one shouted as he ran for the trench on the opposite side of the bridge. The other guard quickly fired a flare into the night sky as Brotheridge simultaneously opened fire. Brotheridge killed him just a moment too late. The British platoon worked fast. Two men dropped grenades into the pillboxes on the west side of the bridge, ensuring the German soldiers inside could not detonate the explosives which were in place to destroy the bridge. Return fire was directed at other Germans now shooting from the opposite shore. An Airspeed Horsa under tow. By 12:21 AM, five minutes after Brotheridge’s platoon hit the ground, they had captured the bridge and secured its defenses. Before long, Howard received word that his men had taken the other bridge as well. They would hold those positions until British forces arrived from the beaches later that morning to take over. But it wasn’t all good news for Howard. Two men under his command had been killed: Greenhalgh just after landing, and now he learned that Brotheridge had been killed in action. Herbert Denham Gravestone at Ranville Churchyard. As that first German sentry’s flare had lit the night earlier, a German machine gunner set up in a cafe on the far bank of the canal fired a burst at Brotheridge, hitting him in the neck and back. Brotheridge fell as he threw a grenade that took out a machine gun position nearby. He died soon after. 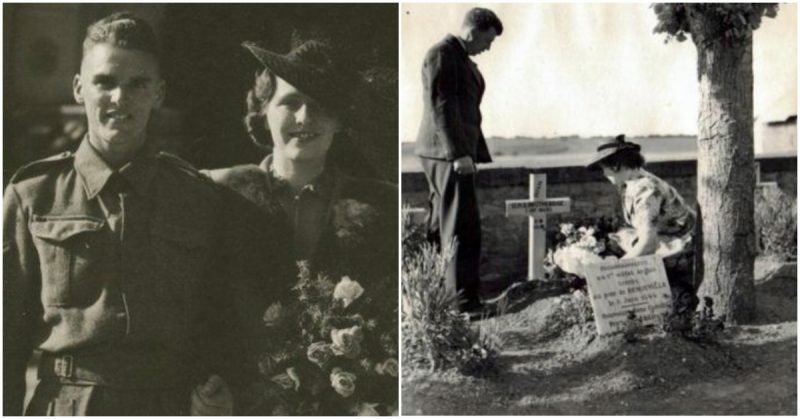 He was a brave leader and now, buried in a cemetery not far from where he died, he is remembered as the first Allied soldier of thousands more to fall on D-Day. The Bénouville Bridge, captured with the cost of his life, is now named the Pegasus Bridge in honor of the 2nd Ox and Bucks, whose uniform is adorned with a Pegasus.